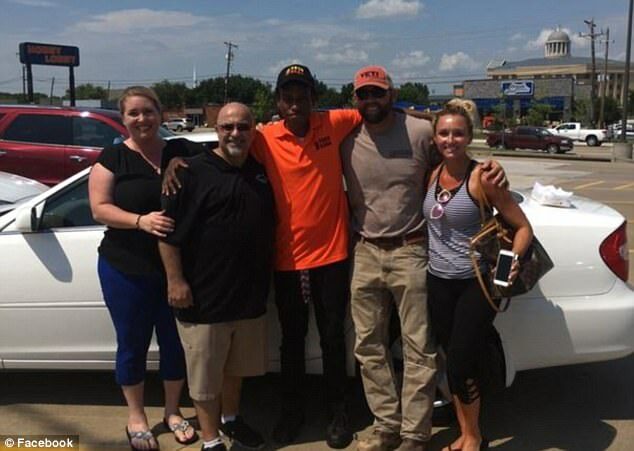 The emotional moment a group of Texas strangers presented a 20-year-old fast food worker who walked six miles for work every day with a car has been captured on camera. Justin Korva began crying when he was given the vehicle days after telling Andy Mitchell of Rockwall he was walking so he could save for a car of his own. Mitchell had rallied his community to raise money and after just 48 hours the efforts yielded enough cash to buy the car. The temperatures were around 95-degrees when Mitchell saw Korva walking along side the road in his Taco Casa uniform on June 21. During the drive to Korva's job at Taco Casa, Korva told Mitchell he was determined to save up money and someday, he hoped, he would be able to afford a car. After dropping off Korva at work, Mitchell posted about the man's determination on Facebook. Hundreds of people in the community saw his post, including Samee Dowlatshahi, owner of Samee's Pizza Getti Italian Bistro & Lounge in Rockwall. Dowlatshahi offered to put a donation box inside his pizza joint to help Korva in his quest to buy a car. In just 48 hours, and with help from Korva's new friend Mitchell, they raised more than $5,500. A friend of Dowlatshahi, Danny Rawls, the general sales manager at Toyota of Rockwall heard Korva's inspiring story. 'I presented it to my general manager and said, "Hey, let's help the kid. It seems like a great story,"' Rawls told CBS News. His boss agreed, and the pair reduced the price on a 2004 Toyota Camry that was available. There was even enough left over to pay for his insurance for a year, plus two years' worth of oil changes and a $500 gas card. Last Friday, the group that helped buy the car drove the white 2004 Camry to Taco Casa and asked Korva to come outside. 'It's your car. This is your car,' Mitchell repeated. Korva gave each man a hug, wiping tears from his eyes as he walked toward the car. Later that day, Rawls helped Korva complete the paperwork on the car and put the title in his name. 'Surreal' is the only word Rawls could use to describe the moment he watched Korva walk away with the keys. An example of how much better individual charity works compared to government handouts. Push Back Against Border Checkpoints Located 100s of Miles from Borders!